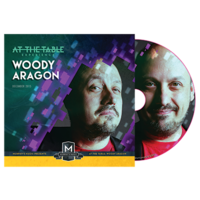 Today, when you order "At the Table Live Lecture Woody Aragon - DVD", you'll instantly be emailed a Penguin Magic gift certificate. You can spend it on anything you like at Penguin, just like cash. Just complete your order as normal, and within seconds you'll get an email with your gift certificate. Blushing- The effect that fooled Gregory Wilson!!! The spectator names two cards. 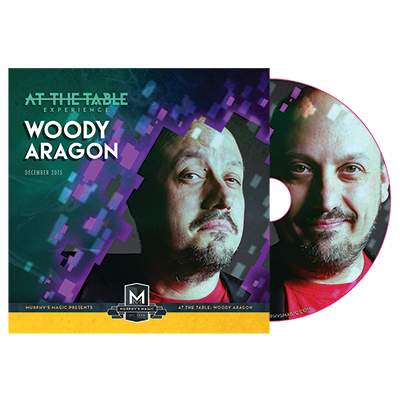 Once they do you spread through the deck and one of the spectators thought of cards is the only card in the deck that that has a different colored back. You very fairly and cleanly place the card on the table and it changes to the second thought of card! 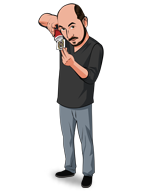 Vanishing Card- Woody talks about a brilliant way to vanish a card within a deck that involves no sleight of hand! Psychic Poker- An effect you'll have to see to believe ladies and gentleman! A folded bill is placed on the table and the spectator shuffles the deck. They then deal 4 piles of 5 cards and you know which poker hands are in each pile! Not only that but the outcome is all written on the bill! False Shuffles- Woody teaches several deceiving false shuffles that will go straight into your arsenal! Back In Time- A brilliant mix between any card and any number and torn and restored card that will have your spectator wanting to go "back in time" to try and figure out how you did it. What To Do When You Fail An Effect- Get advice from a pro as he talks about what to do when you fail an effect. This is something that every magician should know!